A New Text that Brings Psychiatric Nursing Skills into Clinical Practice! 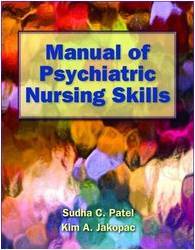 Manual of Psychiatric Nursing Skills guides nursing students and practicing nurses towards enhancing fundamental psychiatric nursing skills competency in specific assessment and interventions for the selected psychiatric disorders. A nursing skill book in a manual format, this text is handy at the clinical site and encourages readers to translate their theoretical knowledge and psychiatric nursing skills into clinical practice.